Katy Perry and Taylor Swift have been making news again. This time in the form of a Twitter feud. The Bad Blood between Katy and Taylor has been running ever since they fell out as friends. The reason for the dissolving of their friendship isn't widely known, although rumors say it is about Katy stealing a dancer from Taylor, while others think it may be the fact that Taylor is secretly a mean girl. This was a Mean Girls reference to a super-popular, vain, egotistical, and judgmental competitor: Regina George, who had the best clothes, the best hair, the best high school life, and a serious lack of empathy or kindness. Seems like Katy wants nothing to do with Taylor. The feud resurfaced this year when Nicki Minaj tweeted about not being nominated for the VMAs because she didn't have skinny bodies in her videos. 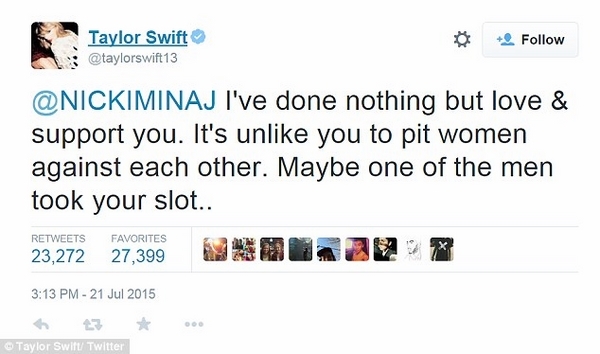 Taylor took this as a reference about her and tweeted that Nicki could join her on stage any time if she wins the award. So, Katy's hatred of Taylor isn't going to stop anytime soon. Which leaves us wondering, is Taylor far sneakier than we thought? Or is this all over one Rolling Stone quote from Taylor about a female who she's not sure if she's friends with? The world may never know. But we're waiting anxiously to find out. Until then, Katy and Taylor on a combined world tour is not going to happen anytime soon.